Today, many Security Operations Centers (SOCs) are highly targeted by cybercriminals and security analysts are increasingly overwhelmed with excessive alerts, outdated metrics, and limited integration. With alerts and incidents skyrocketing, how can organizations operate efficient, highly effective security operations? 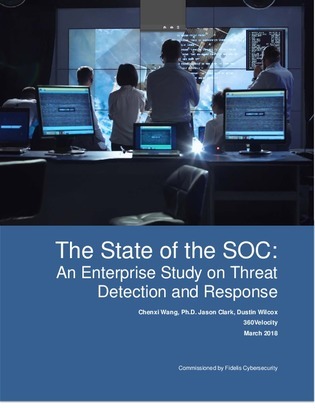 360Velocity conducted an enterprise study on the state of the SOC, including current trends and practices of threat detection and response. The results reveal how different organizations manage SOCs, incident response and threat hunting tasks. Download this report for a deeper understanding of the specific challenges facing many SOCs today.